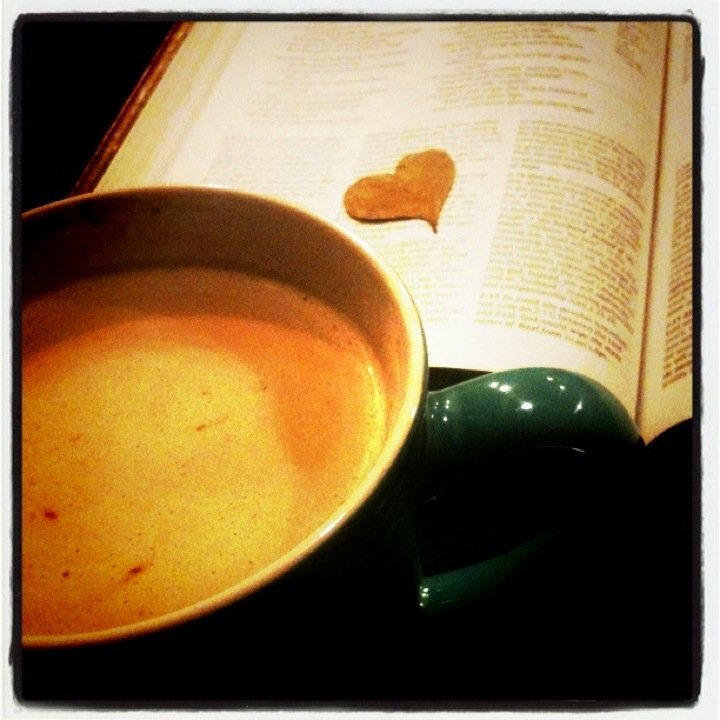 That's what my mornings look like: Coffee + Bible time! It's my favorite time of day. For the past 4-5 years, I have prayed for a verse that will be my theme, my motivation, my encouragement for that year. 2010's verse was (well still is till tomorrow night at Midnight)Matthew 16:26, "For what profit is it to a man if he gains the whole world, and loses his own soul? Or what will a man give in exchange for his soul?" To be quite frank with you, I was a bit offended by God that this would be the verse He chose for me. In my little self-obsessed mind, my walk with the Lord was ok. However, the Lord's agenda for me was a bit different. He had bootcamp in store for me. (you can read yesterday's post for more) This verse proved to be an anchor for me, a verse that I used as a mirror: Am I gaining this world and all it's luxuries at the cost of my soul? Hmmm, I don't want to live that way. I want to live my life for the then and there and not the here and now. I love Matthew 16:26! Last year I posted A Year in Verses and will do the same this year. Raquel, what are you talking about? What is a year of verses? Glad you asked. Two years ago, I was challenged by a verse, a couple of verses actually, to make God's word at home in my heart. So I challenged myself to journal a verse per day. From whatever I read that day, to jot it down and date it. This has kept me accountable to being in God's word daily. So here I go, sharing 1 verse from each month out of the 364 verses that I received this year in my quiet time with Jesus. I challenge you, journal 1 verse a day. Share that verse with others. And make it personal, like the November verse I posted. God's word is powerful and intimate. May you be drawn into God's word like never before. May you never be quenched and satisfied apart from every word that proceeds from the mouth of God, found in the Bible. Happy 2011! and if you're not tired of reading- ck out last year's verses and then dig in to God's word. Has God given you a verse? Share it with me. that's awesome! :D I love the photo as well... did you take that? I did take the photo. I always have my iPhone ready to take a shot. Lol and the heart shape paper is actually a heart shaped leaf that I found on the street. Reminds me of God's amazing love. I keep in the book of Hosea. Your verse rocks!!! I love it. Must highlight that one. I try to share verses via text every day and yours will be the final verse I share with my friends for this year. God bless you!!! I love this idea so much! I actually kind of use my Bible as my journal.. so as I am going through different struggles or ones that are the same (like my arm), I just circle those verses.. write the struggle or praise and a date.. it's so encouraging to look through my Bible and see what God has done! Love this Idea...!!!! What a great challenge! Also,may I use your wonderful photo in my blogging?